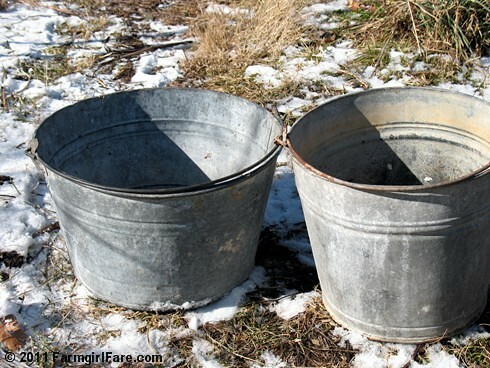 Vintage metal buckets filled with garden plans, ideas, and dreams—and yesterday, lots of wonderful donkey manure for the compost pile. Three or four years ago, I found myself wide awake with insomnia at 3:00am on January 1st, scribbling down a ridiculously long list of goals and plans for the new year. I don't think I looked at the list again until I found it months later in a pile of paperwork clutter, and naturally hardly anything on it had been accomplished. Talk about a downer. It's good to have goals (and I've always been a list maker), but this year I'm keeping things straightforward and simple. 3. More compost making—or at least more some compost pile turning. 4. Keep my new beagle puppy out of my very unbeagleproof-fenced garden. 5. Keep better gardening records! I think I can do it. Okay, maybe not the puppy part. But definitely everything else, especially since, for various reasons, I didn't do much of 1, 2, 3, and 5 in 2010. Here's to a bountiful new year! So what are your gardening hopes, dreams, goals, and plans for 2011? © FarmgirlFare.com, the dreaming and scheming foodie farm blog where my garden plans have a habit of growing out of control during the frozen and snowy days of winter. Yours, too?